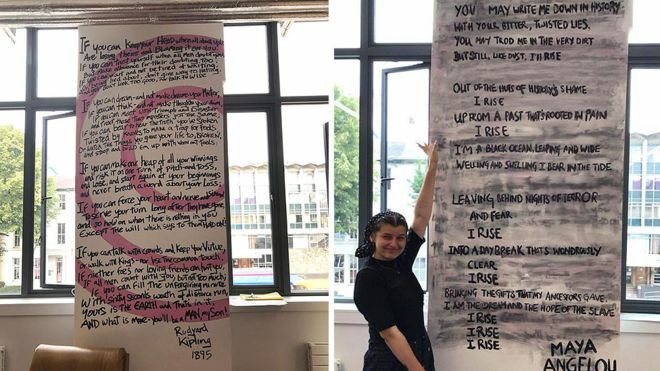 A scandal is brewing in the University of Manchester where students have “defaced” a mural with Rudyard Kipling's poem “If” as a protest against his "racist" work. As told by the BBC, Manchester University has just had its student union building renovated, and the mural was a part of the renovation. However, not all students liked the results preferring to replace Kipling’s poem on the wall with one written by Maya Angelou. The Typical Student team learned the details. According to Riddi Viswanathan, the student union diversity officer, other student union members believe Kipling's poems are "not in line with their values." So, they decided to eliminate “The White Man's Burden,” one of his most famous poems. Instead, they claimed Maya Angelou’s works are much more suitable to properly represent "black and brown voices." On the other hand, an expert Jan Montefiore, has quite the opposite opinion. The professor emeritus of 20th Century literature at Kent University who happens to be an author of Kipling’s biography published in 2007 believes it is "terribly crude” to label Kipling as a racist. Before the student building was commissioned, “If” had been painted on the Leaders Lounge wall on July 13. Surprisingly, it was approved by the students union admins without taking the students’ opinion into consideration. Three days later the mural was painted over with “Still I Rise” by Maya Angelou. 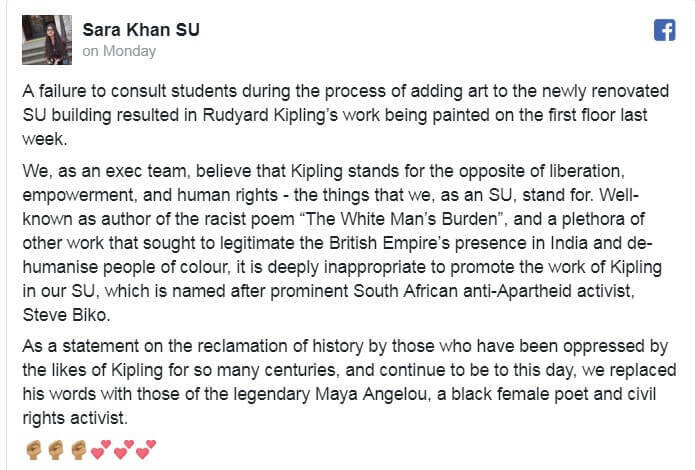 According to Sara Khan, the union liberation and access officer, Kipling was deemed "racist" because his work supported the colonialism of the British Empire. Instead, “Still I Rise” is seen as a "reclamation of history by those who have been oppressed by the likes of Kipling for so many centuries". Kipling’s “The White Man's Burden” written in 1899 is known for urging America to implement imperial practices in the Philippines. Even back then the book caused an uproar for being "completely unacceptable now and fairly unacceptable then". The student union had to apologize to students for not taking their opinion into consideration adding the that “painting of Angelou's work was "a brilliant start to that initiative” As for The University of Manchester admins, they said the union was “independently operated” and didn’t give any further comments.